Image caption Austin Ross put up posters which proclaimed "Hitler was right"
A man who daubed swastikas and racist slogans across a Welsh city has been jailed for six years. 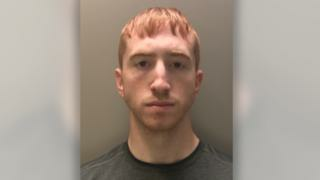 Austin Ross, 23, admitted setting fire to a Masonic hall and school in Newport and put up posters on buildings which proclaimed "Hitler did nothing wrong". Ross had already pleaded guilty to nine counts of racially aggravated damage to property, four of racially aggravated harassment and two counts of arson. He showed no reaction when he was sentenced at Newport Crown Court. A number of locations were targeted by Ross, including the University of South Wales campus, the Riverfront Theatre, Maindee Primary School and Bassaleg Secondary School. 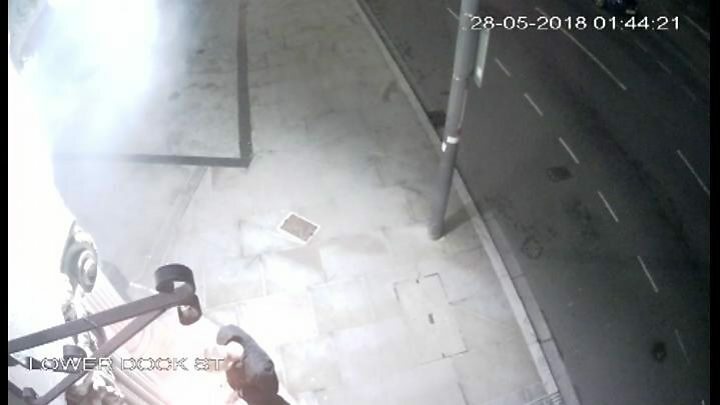 Police described the spree, which they said happened in May, as "a series of hate crime incidents". A number of the buildings were vandalised with swastikas, the slogan "Marxist filth" and the initials "SRN", which refers to the far-right group System Resistance Network. Ross also put up dozens of SRN posters which read "Hitler did nothing wrong" and "Hitler was right". A supporter of English Defence League co-founder Tommy Robinson, whose real name is Stephen Yaxley-Lennon, Ross also daubed walls with the words "Free Tommy". Following sentencing on Tuesday, Det Ch Insp Nicholas Wilkie of Gwent Police said: "There is no place for hate crime in Gwent, and we will continue to take a zero tolerance approach to this type of offending."